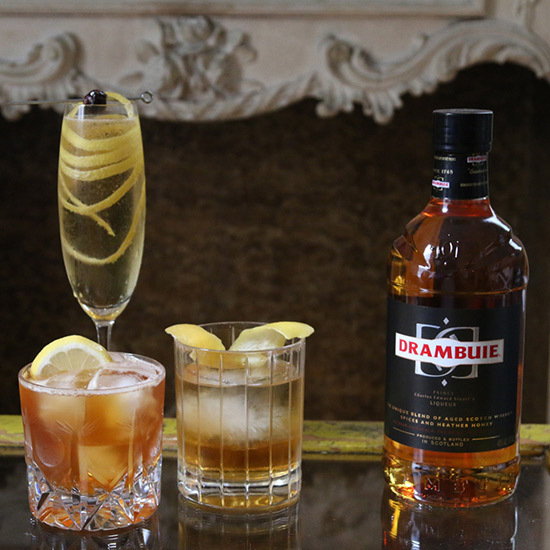 There's no better time to learn about Drambuie than than the fall. For those of you who are unfamiliar with it, Drambuie is a blend of aged Scotch, heather honey and herbs that has a sweet, but balanced flavor. Unsurprisingly, it mixes incredibly well with Scotch—the whisky-Drambuie cocktail Rusty Nail is a true classic—but the liqueur's own complexity means it's great to use whether Scotch is involved or not. Here are three simple cocktail recipes to try. Named for the prince who led a Scottish uprising against the English, this cocktail combines Drambuie with one of our favorite things: bubbles. Don't skip the garnish here; lemon peel will help the sparkling wine keep bubbling and bubbling (so be careful as you add it, lest you have an unexpected sparkling volcano on your hands). Instructions: In a tall glass or champagne flute, pour 1 ounce of Drambuie and then 4 ounces of sparkling wine. Garnish with a long, skinny lemon peel. While using a top-dollar Scotch certainly wouldn't hurt this cocktail (and we wouldn't say no to drinking it with Macallan 18, if you're pouring), a sensibly priced blended Scotch will do just fine. Instructions: In a mixing glass with ice, combine 1 ounce of Drambuie with 2 ounces of Scotch. Dash in some Angostura bitters. Stir until well-chilled, then strain into a rocks glass with fresh ice. Garnish with a lemon peel, twisting it over the drink before you serve to release its citrus oils. Good coffee cocktails can be few and fair between. But by using high-quality, freshly-made coffee and pairing it with classy ingredients like Drambuie, it's possible to create a drink that makes great use of coffee's complex, slightly bitter backbone, without all the sweet drek you get from coffee liqueurs. Instructions: In a cocktail shaker with ice, combine 1 1/2 ounces of vodka, 1 ounce of Drambuie, and 1 ounce of freshly made coffee (you can let it cool first). Add 1/4 ounce of fresh lemon juice and a dash of Angostura bitters. Shake all that up, and strain into a rocks glass with fresh ice. Garnish with a lemon wheel.